Did your favorite place make the list? TEXAS — TEXAS -- If you have ever eaten breakfast in Texas, you're probably familiar with kolaches and klobasnikies. Yes, Texans eat more than just tacos in the morning. Kolaches and klobasnikies are fruit- and meat-filled pastries, respectively, that are part of what makes Texas a food paradise. Although this sweet dish originated from Czech immigrants, there are several locations across Texas that sell the Czech delicacy. Which brings us to the question: "Where can I find good kolaches in Texas?" Don't worry, KVUE has you covered. 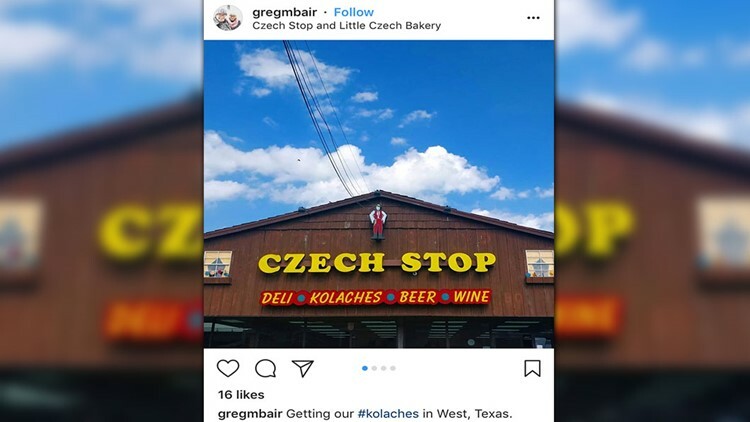 Czech out this full list of the best kolache places in Texas! Heck, just visit them all since you can never have just one kolache. Early morning kolache stop en route to the airport. Bye bye Austin. Bye bye borrowed iPhone. Bye bye instagram. Lone Star Kolaches is dedicated to offering one of the widest varieties of kolaches in Texas! From egg to sausage and sweet kolaches, visiting them is a must if you're a fan of the treat. They even have a pizza roll kolache! With six locations across the Austin area and a catering service, there's no excuse for not trying out their baked goodies. Location: For a full list of locations, click here. As their name hints in itself, Kolache Haven is heaven on earth for anyone with a sweet tooth -- and let's be honest, don't we all have one? All the way in Denton, Texas, Kolache Haven offers what most reviews call "savory" and "excellent" kolaches. While you're there, be sure to try out their delicious cinnamon buns. Its finally open when I'm in the area!!!! You can always count on Haby's Alsation Bakery to be open Monday-Saturday from 5:30 a.m. to 7 p.m. Located in Castroville, Texas, Haby's is known for their great customer service and their different baked goods that are affordably priced. For quality pastries, kolaches and more, stop by Haby's! Located in the "Heart of Texas," it's easy to see why Czech Stop is loved by so many. Czech Stop, "Where delicious is our business," customers can expect to receive top quality baked goods along with great customer service. And if West, Texas, is a little too far for you -- good news: they ship! The Kolache Factory has a whopping 20 locations across the United States. They are the perfect place to stop by for a quick breakfast or sweet snack. Their kolaches are larger than most, which is definitely a plus. On top of that, the Kolache Factory offers catering and shipping services even if you're ordering from out of state. From a country store to a bakery that serves kolaches, burgers and breakfast, Hruska's Store and Bakery has it all. Halfway between Austin and Houston, Hruska's has been around town for almost a century. With over 16 types of delectable kolaches, Hruska's is a must stop and shop. Aside from their wide array of donuts, tasty kolaches are offered at Hill Country Donuts. With a genuine staff, Hill Country Donuts has some of the best sausage and cheese kolaches you will ever have! If you're looking for a nice place to get your day started, head on by Hill Country Donuts. When you see or hear the word "Czech" in a bakery's name, you already know the treats will be great, and Two Czech Chicks is no exception. The kolaches at Two Czech Chicks are the real deal. Some customers even drive across Texas to get their hands on one! Weikel's is a family-owned bakery that offers deli sandwiches, specialty groceries and, of course, kolaches. With their main location in La Grange, Texas, Weikel's Bakery also has locations in Carmine and Brenham, Texas. Inside a small locally-owned bakery called The Old Main Street Bakery, you will find award-winning kolaches that are hand-made with fresh, all-natural ingredients. Old Main Street offers a wide variety of sweet kolache fillings as well as savory kolache choices. If you're not the type to venture out, you can make kolaches in your home using this recipe from Texas Monthly.